Flynn's Calls With Russia's Ambassador: Who Knew What, and When? 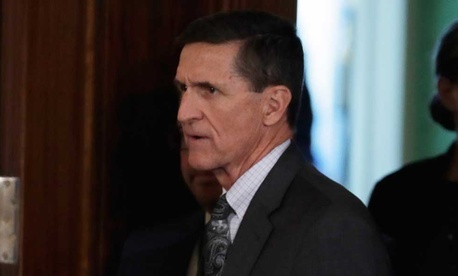 Mike Flynn resigned Monday as President Trump’s national-security adviser, capping a tumultuous few weeks that began with revelations he had discussed U.S. sanctions on Russia with Sergey Kislyak, the Russian ambassador to the U.S., before Trump’s inauguration on January 20. The nature of the conversations, what Flynn told Vice President Mike Pence and others who denied sanctions were discussed, and a steady trickle of leaks to the news media on the matter ultimately became too much of a distraction for the administration, prompting Steve Bannon, Trump’s chief strategist, to reportedly ask for—and receive—Flynn’s resignation. But Sean Spicer, the White House spokesman, said Tuesday it was Trump who sought—and received—Flynn’s resignation because the “level of trust had eroded to a point” Trump had to act. November 8, 2016: Donald Trump is elected the 45th president of the United States. Flynn, a former Army general who was an early and ardent supporter of the Republican nominee, is expected to get a senior position in the Trump White House. November 18: Trump names Flynn as his national-security adviser. December 29: President Obama announced measures, including sanctions, on Russia for its interference in the U.S. election. The sanctions are in addition to those imposed on Moscow following its invasion in 2014 of Ukraine’s Crimea region. Flynn and Kislyak speak that day, The Washington Post reports, citing a Trump transition official. The official says sanctions weren’t discussed. Additionally, CNN reports the Russian ambassador texted Flynn on December 28. December 30: Russian President Vladimir Putin says Moscow will not retaliate. The Post says that prompted U.S. intelligence analysts to look for reasons why Putin declined to impose his own measures against the U.S. They found, the newspaper reported, Kislyak’s communications, including the phone call, with Flynn. Sally Yates, then the deputy attorney general, found Flynn’s comments in the call “highly significant,” the Post reported. This official later added that Flynn’s initial call was to express condolences to Kislyak after the terrorist killing of the Russian ambassador to Ankara Dec. 19, and that Flynn made a second call Dec. 28 to express condolences for the shoot-down of a Russian plane carrying a choir to Syria. In that second call, Flynn also discussed plans for a Trump-Putin conversation sometime after the inauguration. In addition, a second Trump official said the Dec. 28 call included an invitation from Kislyak for a Trump administration official to visit Kazakhstan for a conference in late January. January 13: Sean Spicer, the White House spokesman, told reporters in a conference call that Flynn and Kislyak only discussed a post-inauguration call between Trump and Putin. “That was it, plain and simple,” he said. January 19: Yates, the deputy attorney general, and senior intelligence officials debated what to do with the information they had on Flynn. The Post reported that FBI Director James Comey argued against notifying Trump administration officials of the communications. January 20: Trump was inaugurated; Flynn officially became national-security adviser. January 23: Spicer told reporters he spoke with Flynn about the issue the previous night (January 22). He said Flynn and the Russian envoy spoke once. They discussed, he said, the Russian plane crash, the Syrian civil war, Christmas, and a call between their two leaders. Yates raised the issue again with Comey, who the Post said dropped his initial opposition to briefing the administration. February 10: An unnamed Trump administration official told the Post Pence either misspoke or was misled by Flynn. Further, The New York Times reported that transcripts existed of the conversation. While the alleged content of the conversations was a likely breach of protocol during a presidential transition—and could be a breach of the law—it’s unlikely to lead to any charges against Flynn. Still, Flynn went to Mar-a-Lago, Trump’s Florida retreat, with the president and the Japanese prime minister. He appeared to enjoy Trump’s confidence, and even huddled with the president when news broke of North Korea’s missile launch. Still, there was no public word from Trump over the reports about his national-security adviser. February 13: Kellyanne Conway, Trump’s counselor, said on MSNBC Flynn enjoyed the president’s confidence. Hours later, Flynn resigned. February 14: Conway said it was Flynn’s decision to resign; Spicer said Trump asked for Flynn’s resignation.